Labor Day is really one of the most bittersweet days on the calendar. It awards us a three day weekend during the most gorgeous time of year, but it also signifies the end of summer. The end of weekends in the Hamptons (or in my case, weekdays), the end of wearing sandals everyday, and if you're a rules girl, the end of wearing white. Personally, I think this is a rule that should be put on the shelves to gather dust for all eternity. White is amazing. It looks good on everyone and it goes with everything. Especially more white. My second Labor Day Eve in Manhattan was a bit like an anniversary celebration of the first one. Last summer, it marked the beginning of our friendship with all our neighbors, and we took most of the same crowd to the same bar (Bar 196) and celebrated - well - everything and nothing I suppose. I awoke on Monday laughing to myself about what an excellent night we had, put on an all white ensemble in honor of the day, and headed off to Soho for a full day of work. I labored on Labor Day, but so what? I must say I am just thrilled to be full-time laboring at all. 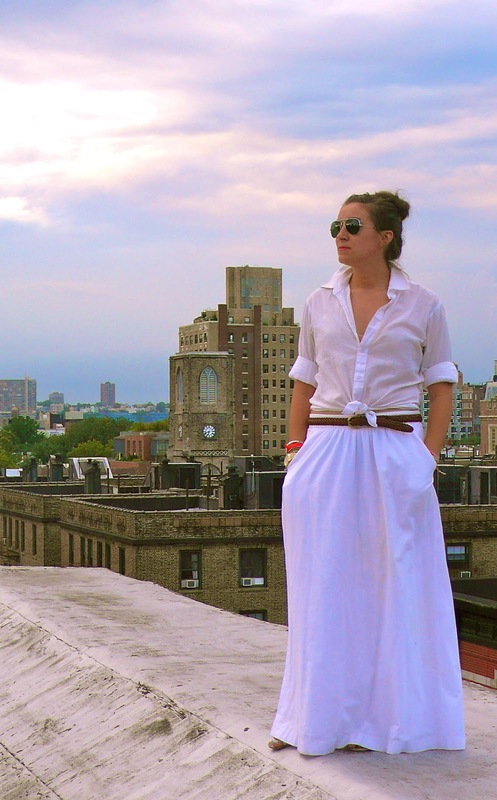 H&M men's button down shirt; Gap skirt; vintage belt; Ray Ban aviators. I am just so obsessed with this skirt. It went through hell over the 4th of July in Kiawah (dancing on a dirt dance floor at an oyster bake apparently isn't good for floor-length white clothing...) but I finally took it to the dry cleaner /tailor so it could get a few more wears this summer. I have a hard time finding maxi skirts that fit me the right way, and I think the key with this one is that it sits a bit lower on my waist than most, which works for my figure. This shirt is a favorite too; I just really can't say enough about the mens shirts at H&M. The price is right and fit is perfect. It alarms me slightly that this one is so sheer and meant for a man, but all the better for me, I guess! I'm also wearing some beat up gold sandals from Urban Outfitters, but they're not really worth mentioning. Quick post, and no detail shots, I do apologize. Oh, and why so serious, Taylor? Jeeze. Anyway, as I mentioned above, I just started a new job, so I've been a crazed and excited human for the past two weeks. Now The IFB conference is just two days away, fashion week is looming, and I'm still trying to figure out how to time manage my life. Bare with me my most treasured readers, I won't abandon you! So in love with that skirt, was very sad when it did not fit right! I agree! The Labor Day/white rule is outdated. I'm a year-round-white girl! 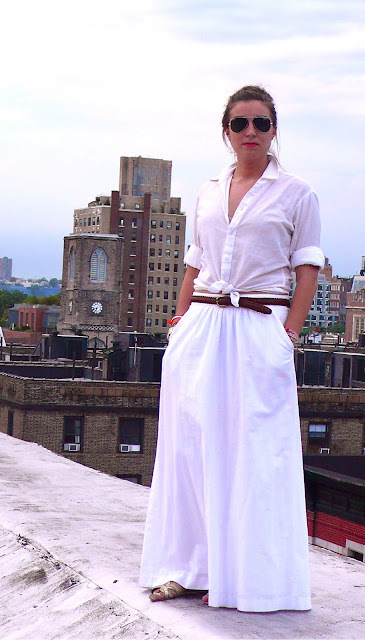 I love this outfit - you look super sophisticated, yet casual and approachable. Great look!